The Nash-Healey was re-designed for 1952 after just one brief year with it’s original design. The restyle is the classic design you see here with the Nash grille and inboard headlights – all courtesy of Pininfarina. 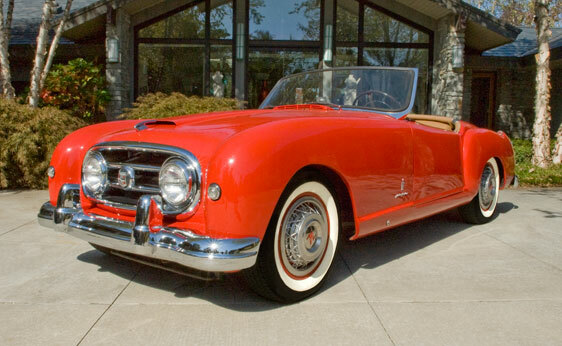 The 4.1 liter Nash inline six produces 140 horsepower – enough to make it true to its claim of “America’s first post-war sports car.” The powertrain was sent to Healey in England for installation into a chassis and then onto Pininfarina in Italy to have this attractive body fitted. The European-American collaboration to produce a good-looking and well-performing sports car is a formula that would continue for years to come. All of this shipping made the car rather expensive at $5,908 compared to the then brand-new Corvette which sold for $3,513. The car is offered by RM without reserve and without a current pre-auction estimate but if I had to guess I’d put it between $75,000 and $110,000… although Gooding & Co. sold one last year in Arizona for $143,000. Anything is possible in Arizona in January. See more on this lot here and more on the sale here. This entry was posted in Uncategorized and tagged 1953, auction, car, classic, healey, nash, nash-healey, RM, rm auctions, roadster by classiccarweekly. Bookmark the permalink.